In the wake of New York's freshly-passed abortion expansion bill, pro-life citizens nationwide are reaching out to their elected officials at every level, pleading with them to reconsider new measures to protect the unborn children in their own states. 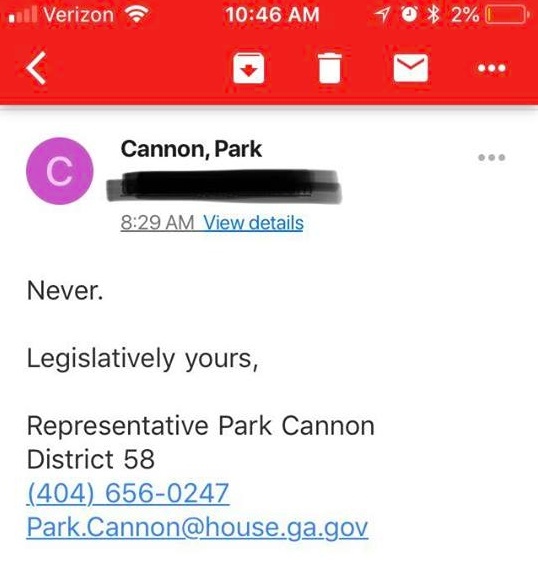 Brittany, an Atlanta mom and wife, did just that in reaching out to her district rep in Georgia's House of Representatives, Park Cannon. Knowing Rep. Cannon's unapologetically pro-abortion stance, Brittany didn't expect much more than a copied-and-pasted response, or a generic expression of appreciation for the email but a steadfast commitment to protecting access to abortion in Georgia. The response Brittany received, however, blew her away. In a heartfelt email to Cannon, Brittany thanked her representative for her dedication and service to her constituents. "Your labor and commitment toward upholding justice and preserving the Constitutional standards of life, liberty, and the pursuit of happiness are greatly appreciated," Brittany wrote. "I am hopeful that this message finds you well and I offer my commitment to pray for you and your courage as you represent your constituency." "My purpose in writing you is to ask for your commitment to uphold justice on behalf of all pre-born human beings who are being killed through abortion in our state," she continued. "You are under obligation to preserve and protect the lives, liberty, and property of all the human beings under your jurisdiction." "Since Roe v. Wade, over sixty million human beings have been murdered through abortion in our nation," Brittany's email continued. "Over three thousand are killed every day across our great country. While I am grateful for every single child that has been saved through incremental legislation, the fact is, babies are still being killed (with malice aforethought) in our state." "I am confident that you are aware that Roe v. Wade was built upon false premises," Brittany elaborated to Cannon. "1. Babies in the womb are not 'potential human life.' It is an irrefutable biblical and biological fact that they are human from conception. 2. The Supreme Court does not have the legislative power to create [a] law that would subvert the laws of the States in regard to the killing of human beings. According to the United States Constitution, the authority to create legislation is given to Congress." "Therefore, I plead with you as a constituent and fellow citizen of this State to preserve the lives of all of the human beings in the womb, and work to immediately criminalize abortion in our state. Stand with courage and stand for justice. I am not asking you to do anything lawless. I am asking you to stand on the law and protect the lives of these children," Brittany wrote. "You have the power and the obligation to do so. I offer you my full support. If you uphold justice and protect the lives of pre-born human beings, I will work tirelessly to support you, to rally the local churches and communities, and to be a voice that proclaims that you are a legislator who can be trusted to keep your promises and commitments to protect the people under your jurisdiction. Be courageous." "With humility, I am asking you to immediately criminalize abortion, protect these fatherless children, and uphold justice. You have the full support of not only the facts, but also of the people who put you into office," Brittany concluded, calling on Cannon to make a stand. "Stand for the truth. Stand for justice. Be a courageous leader and know that we stand with you. You will have my constant gratitude, prayers, and future support. Thank you for honoring your commitments to the people." "Look, I get that we may have differing views on abortion. But if I, one of your constituents, email you a respectful letter urging you to help keep babies alive, the least you can do is respectfully disagree with me," Brittany said in a social media post about Rep. Cannon's terse response. "This kind of response is absolutely not respectful." Cannon's utter refusal to even offer a considerate response to one of her own constituents is an alarming harbinger of where American democracy may be headed. Please continue to pray for God to soften the hearts of those in power and pray that His will be done among His people!